We are now enjoying the currant jam that we made in July. This is a hands-on, work-with-it recipe…. in other words, you need to be flexible and work with the amount of fruit that you pick. Also, be aware that different moisture levels in the soil will affect the water content in the currants. There are many ways to make jellies, jams and preserves. This is a recipe my husband has been working on for several years. Pick the currants, rinse and remove berries that are rotten or green. Under-ripe fruit is OK as long as it isn’t hard. Wash your jars in very hot water and pour boiling water over your canning lids and rings. Mash the currants in a large soup pot, bring to a boil and gently boil for 3-5 minutes. Put the cooked fruit through a food mill and press out as much juice and pulp as you can without forcing small pieces of skin through the holes. Measure the juice as you return it to the soup pot. For every 1 ¾ cups of juice/pulp, add 1 cup of sugar. Mix well. Cook for approximately 25 minutes at a gentle boil. Skim off excessive foam off the top. As you get close to 25 minutes, test the juice by cupping some on a spoon. If it covers the spoon and slightly gels, it is ready for putting into jars to be canned or to be refrigerated. In high moisture years (like 2011), you will need to cook longer, up to an hour. 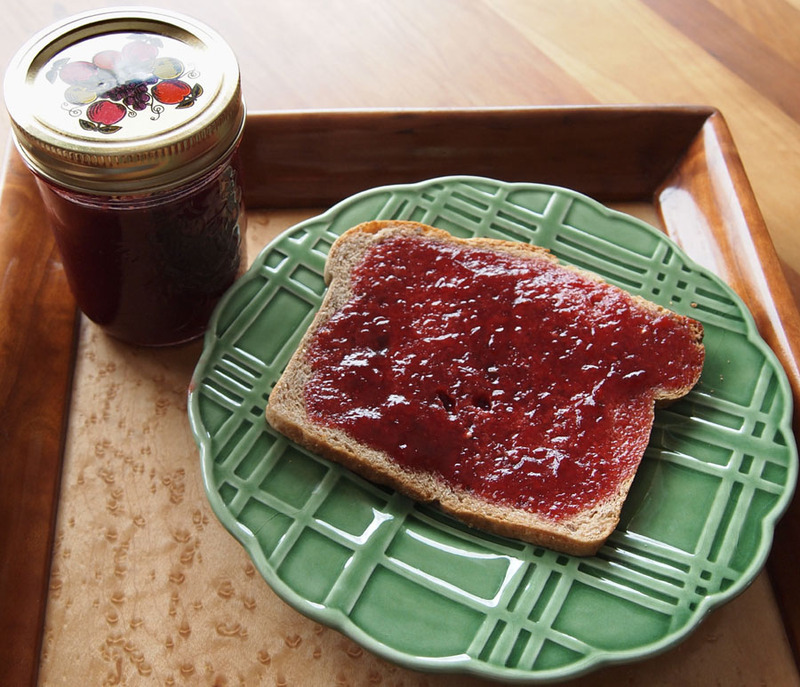 To can or not to can: freshness of flavor – the more you process, the more cooked the jam will taste. We prefer to refrigerate and not can our currant jam. The room in the refrigerator is worth it. A note about pectin — never had to use it as currants normally have a high pectin content. Last year, it might have been a good addition.